This is concentrated skin care. 25 different ampoules solve every cosmetic skin problem. Almost without preservatives thanks to the hermetically sealed glass-ampoules. To open them, just break off their head, undirectionally, using a tissue to protect your fingers from sharp edges. The ampoules will open nearly splinter-free. We are using glass ampules of the highest pharmaceutical grade. Soluble collagen, which the skin has lost can be resupplied externally in concentrated form by this pure Collagen ampoule. is used for dry/extremely dry, slightly chapped skin which shows lines and wrinkles and has a tendency to scale formation. is used to correct extremely dry skin which is under functioning. Vitamin A will activate the sebaceous glands and heal flaky, chapped and reddened skin, caused by environmental damage-e.g. winter winds. This ampoule can be recommended for use in combination with the Vitamin C Cream. The highly sensitive vitamin C has been stabilised as an active ingredient. 2 x 4%, 6%, 8% fruit acid concentrations. Ideal for any combination skin and impure skin. Coenzyme Q 10 is a vital, vitamin-like, micro nutritive substance. It is essential for “cell-breathing” and energy transportation in the mitochondria. Has an anti- inflammatory and astringent effect. Suitable for any skin showing pimples, pustules or other blemishes. Contains Perfluoropolyesther, a modern oxygene carrier. For every skin type. The active ingredients support the skin metabolism. After using consequently the skin looks fresh and relaxed. Energy from the seas. The biological diversity of algae, with the inherent original power of the oceans, opens up new cosmetic treatment methods for us. Modern research on algae supplies us with proof of the results. Contains among others raffermine: soya extracts, serve to strengthen and reorganise the collagen network. They protect the protein fibres of Elastin. Tensine: protein extracts from wheat, deposit a soft and elastic film on the skin. The whole of the skin surface becomes tighter. Loosens excess hornification and saponifies the pore contents. The result is a concentrated deep cleansing. The extremely soothing ampoule helps to normalise any nervous, irritated and problem skin. The carefully balanced composition of ingredients improves the skin’s appearance within a very short time. This luxury product comes from the sea, derived of salmon fish eggs. To gain this valuable cosmetic ingredient, the fish are being “milked”. Caviar cells contain amino acids, proteins, lipids and vitamins. Hyaluron acid exists in human tissues; it can adsorb and store fluids of the skin’s tissues. During life-time, the body looses water and these vital tissue-fluids. There is a possibility to “refill” from outside. Chinese medicine. Ginkgo biloba is considered to be the tree with the greatest longevity and highest level of resistance to outside influences in the world. Anti Age Effect. Evening Primrose Oil Concentrate Ingredients of the seeds are Proteins, they compote of Gystein,Methionin, Tryptophan. Contains cellulose, lignin and oil, with a part of essential fatty acid. The seed oil owns ternary unsaturated gammalinolenic acids. Few known plants contain these valuable acids. Their oil components are especially suitable for conditioning of dry and very dry skin. The skin´s grain and feeling will improve very fast after application. ß carotin and Provitamin A work against strong hornification. They activate cell division and make skin layers renew faster. Vitamin B1, B2, B6 and B12. Vitamin C improves the synthesis of the micro proteins and of the collagen. Vitamin E protects against skin aging and deminerslisation. Minerals and trace elements : calcium, manganese, magnesium and iron. 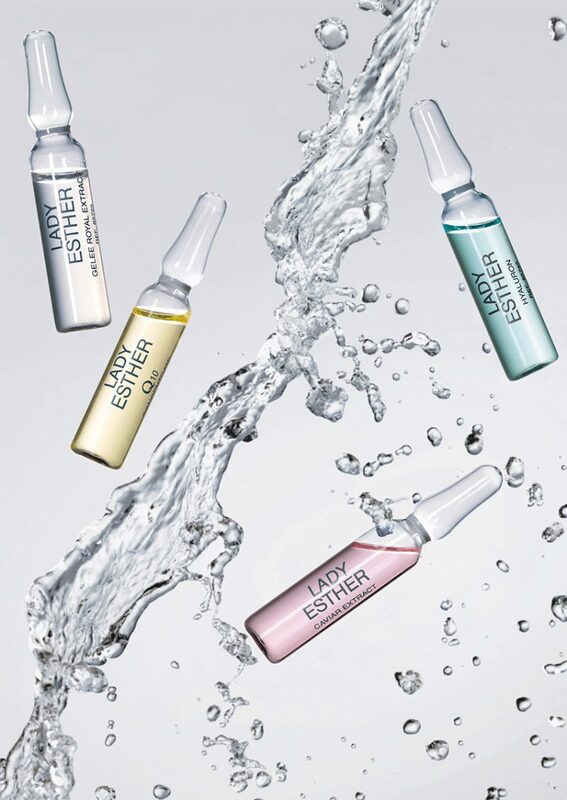 Rich oily ampoule for all skin types. The skin´s natural collagen prouction determines the quality of this network. Matrixyl supports and activates this process. Ginkgo extract counteracts the skin´s again due to light exposure, and acts to intercept free radicals. Gold-glimmer-pigments have an optical effect and are symnol for the luxury and high-value treatment. For a better result use in combination with the Anti-Aging Cream. Linoleic acids are responsible for the high tolerance even with very sensitive skin. Vitamine E for cell protection and cell regeneration. In case of extremely dry skin there will be a delightful feeling.Use the ampoule instead of a cream. For all skin types. Allantoin and panthenol have a soothing effect on irritated skin. Witch hazel cools and refreshes. Aloe vera cares moisture lacking skin. Recommendable after every sun bath, for sun holiday baggage and for solarium users.